The reporters all agreed on one thing: that while they use twitter a great deal, it is limited in its reach and as a tool. Taylor-Vaisey (@TaylorVaisey) agreed, adding while what people say on twitter has value, you still need to go to a scene and follow up. He added that it’s important to remember that not everyone is on twitter. Reevely (@DavidReevely) pointed out that Twitter by its nature rewards “zingers”. “That’s what is dangerous [about Twitter]. Your incentive becomes getting RT’ed.” He said reporters need to work beyond that. “If you’re just a jerk, that’s going to show, count against you instantly,” he said. “Be nice, it doesn’t cost extra,” O’Malley said. “If you wouldn’t say something to someone’s face, don’t tweet it,” O’Malley said. Potter (@jandrewpotter) asked reporters what they thought about tweeting their personal life. McGregor (@glen_mcgregor) said he was less concerned about providing details of his life than he was expressing an opinion on coverage. Smith agreed that there is an incestuousness of #cdnpoli, the hashtag most commonly used on Parliament Hill, and that twitter can exist as “a similar echo chamber” for followers. Taylor-Vaisey said that political reporters should disagree more, not be afraid to be critical. As an example, he mentioned Reevely’s live tweeting a city council meeting the night before, which went until 11 p.m. In one of his tweets, Reevely mentioned that there were no longer any broadcast media in the room. “It would lead to a more robust parliamentary press gallery,” Taylor-Vaisey said. Kady disagreed with Taylor-Vaisey, and said there was “lots of respectful lively disagreement” in the parliamentary press gallery. All panellists agreed that paying attention to social media can take time away from reporting, writing web hits, etc., and that newsrooms need to make a conscious decision how to resource social media without over-taxing a reporter in the field. When Potter asked the reporters what they thought about the humanizing of politicians through Twitter, McGregor said that reporters need to stop turning everything someone tweets into a news story. He referred to NDP MP Pat Martin’s widely-covered anti-Vic Toews twitter rant in December, which led to Martin quitting the social media platform. “We want people to show a little of themselves. If we start reporting every time [politicians] step out of line, they are going to revert to their talking points,” McGregor said. While the reporters’ panel focussed mainly on Twitter, the politicians said their most valuable communications with constituents occurs via Facebook. “We actually see a lot of case work coming in through Facebook,” NDP MP Megan Leslie (@MeganLeslieMP) said. Liberal MP Marc Garneau (@MarcGarneau) said that while he started reaching out to people on Facebook, he moved over to twitter in 2010, and is now a self-described addict to the social media platform. “It’s the first thing I look at in the morning, and I check it many times throughout the day,” Garneau said. More seriously, Watson said that he does 95 per cent of his own tweets. 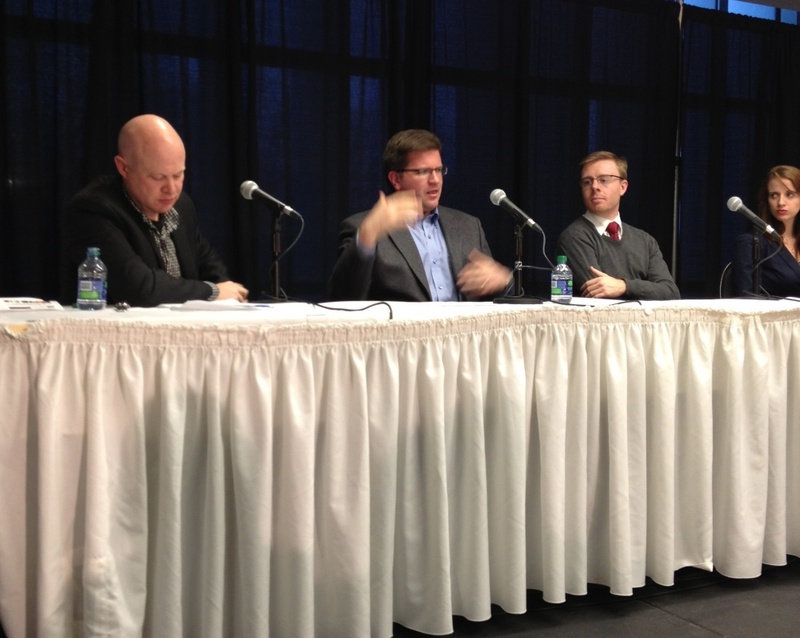 Moderator Chris Waddell (@cwaddell27) asked the politicians if they had a lot of independence when it came to tweeting. “Well, if folks were controlled [by the party], we wouldn’t have Pat Martin’s tweets,” Leslie quipped, to laugher. Watson said that almost every councillor has a twitter account, and that he felt it was a great way to hear from politicians unfiltered. Watson pointed that there is a reality check to the social media platform: While his 19,000 followers may seem impressive, in a city of 900,000 it’s really not reaching everyone – or allowing him to hear from all of his constituents. Leslie said that while it’s hard to judge the issues, it’s also difficult to judge the reach of her story. While Leslie might deliver a “zinger” that amused the parliamentary press gallery, she said she is often disappointed in how rarely this translates into a full story in mass media with wider reach. Leslie said she has a “couple of trolls I have affection for,” and that often she’ll simply reply “right back at you” when they fire off personal attacks. Watson added that twitter is for him an effective way to stop incorrect information in its tracks. He noted a tweet he received from someone who hadn’t seen a snowplough at one of Ottawa’s suburban intersections. Watson then joked that perhaps he could save the city money by simply attaching a plough to the front of his car. Garneau said he will write a tweet to a troll and then delete it before sending. Leslie said she found social media “incredibly useful” when campaigning. “I use it to humanize myself. I love Buffy Vampire Slayer, I tweet about it. I’m a real person…. I make my breakfast in the morning. I’m a real person, I’m just a gal from your community.” She said. “[Twitter] allows people to see part of who you are, that might be humour, or something about the personality that helps them see who you are,” Garneau said. It’s important to look at tweets that you get back saying you’re wonderful and remember that it’s not the whole country that feels this way, he added. Watson said that when campaigning, he always tweets the schedule he gives to the media. “I felt held hostage by my twitter account. People would tweet ‘what do you think about foreign trade, respond or you’re going to lose my vote’,” she said. She added that this was close to impossible in 140 characters. Leslie said she also suffered a twitter whisper campaign that she didn’t live in the riding, (she rents rather than owns property), and is unsure what the 2015 campaign will be like. 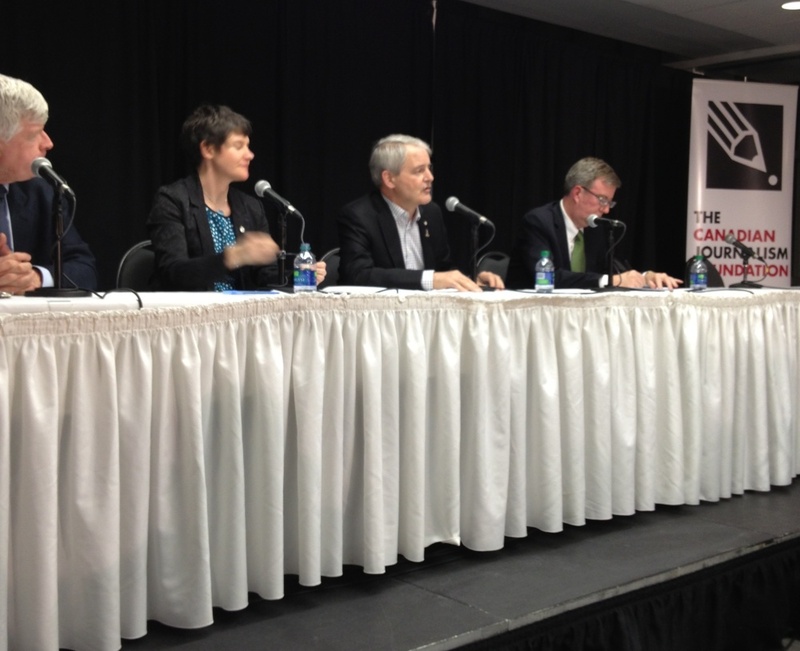 All three politicians agreed that social media hasn’t yet been harnessed for fundraising.